Joy Davidman was an unhappily married writer living in Ossining, New York in 1946. She was a new Christian, after years as an atheist and a communist. Her interest in Christianity prompted her to write author C.S. Lewis (known as Jack to his friends). A correspondence began, and a friendship, with Joy traveling to England to research and work - and to meet Jack finally. 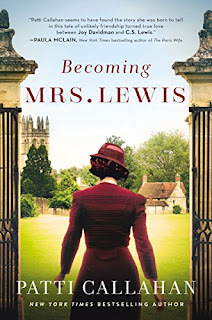 Becoming Mrs. Lewis tells their improbable and tremendously moving love story. I was eager to read Becoming Mrs. Lewis as soon as I heard of it. I grew up with the Narnia books and read some of C.S. Lewis's Christian nonfiction and apologetics as a high school student; we studied them at the Christian school I attended. He is a longtime favorite author of mine, and I was familiar with his love story with Joy through the movie and play Shadowlands. The best word I can find to describe this novel is extraordinary. It is not just a historical novel, although the period details are beautifully realized. It is not just a Christian novel, although the ongoing theological discussions between Joy and Jack (on paper and in person) are fascinating. It is not just a love story, although of course it is that, and more. "I watched as the milk came to a slow boil in the pot; then I poured the chocolate flakes into the white froth, transfixed. Outside, the first snowflake fluttered into view, then melted as it settled onto the windowpane; it was a natural wonder and it lifted my heart. The bird feeder hung from a low branch, and a cardinal passed there and turned its black eye on me. Every simple thing radiated for a brief moment with extraordinary beauty, a daily grace" (p. 18). Later Joy tells a friend, "Look at this world. ... It's such a wonder, profoundly beautiful. I want to live in it that way -- not as if life is one big chore" (p. 35). This sense of wonder and attention to life is one of the many bonds between Joy and Jack as they get to know each other. They are connected, too, through their love of God, the passion for writing, their love of books and reading. I had not read any of Joy's writing before this book and loved the glimpses into her writing process and creative spark. She began writing love sonnets on an ongoing basis to express her feelings for Jack that she did not feel she could share with him verbally. The little glimpses they provide are beautiful. I also loved the details of Jack's life at his home, The Kilns in Oxford, and the remarkable portrayal of his creative inspiration and brilliant mind. There are even brief glimpses of Jack at the Eagle and Child and details about his friendship with the Inklings who met there, including J.R.R. Tolkien. Jack tells Joy about his friendship with Tolles (Tolkien): "We don't like politics. Neither of us has bothered to learn to drive a car. Dante. Theology." (p. 190). At the heart of Becoming Mrs. Lewis, there is, of course, the story of Joy and Jack. Although I knew the basics of their love story, nothing prepared me for how deeply moving this novel truly is. When I finished reading I had to just put the book down and think about it for a while. I have been thinking about it since. I cannot recommend Becoming Mrs. Lewis highly enough for anyone interested in the lives of C.S. Lewis and Joy Davidman, for anyone interested in Christian theology, anyone who loves beautifully rendered historical fiction. This is such a lovely read!